When planning your pet hedgehog’s meal, consider these recommendations: for the average healthy hedgehog, protein content should be greater than 20%, for nursing moms and growing babies, you can use about 28-35% protein sources. For the fat requirement, on the other hand, consider giving between 5 and 15% for the average hedgehog. Nursing moms and growing babies require a higher amount of fat in the foods that they eat, but maintenance food should go or food that has a lower amount of fat content. For the fiber requirement, use about 15% of all food sources. Foods with a higher moisture content that you will offer to your pet, you will need to add more fiber in the diet that you’d prepare for your hedgehog. Domesticated hedgehogs are mostly limited to pet foods available in local pet stores. However, as they get to be away from the wild that they once loved, they will even get parasites if they consume wild bugs after getting used to eating the kind of foods that domesticated ones get to eat. As such, you may consider giving your pet other food sources that will provide all the nutrients and minerals that it will need to maintain its overall health. 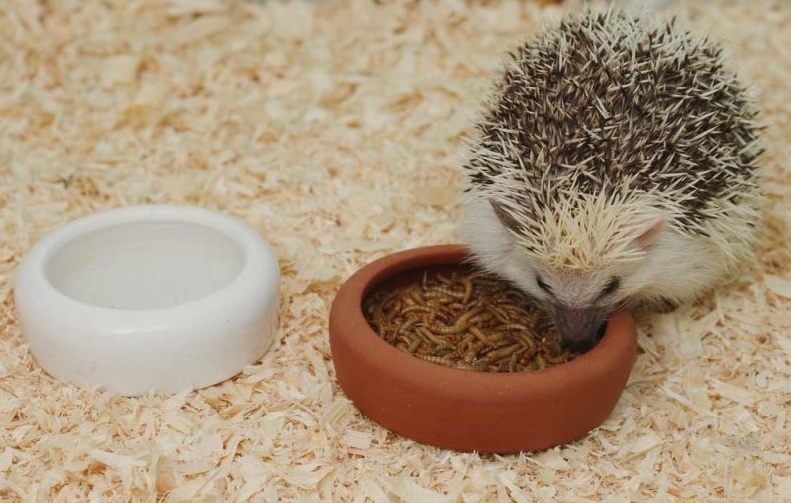 Your pet hedgehog will also benefit from high-quality cat food. Just make sure that the main ingredients listed on the label indicate chicken as the first on the list and not any other meat products and corn. Use an adult formula cat food for hedgehogs that contains about 34-38% protein and between 9-14% fat. Take note, however, that you cannot feed your hedgehog canned cat food regularly as this may cause dental problems in the future. It will be just fine to give your pet 1-2 tablespoons of adult cat food a day. Just keep an eye on its weight. If you notice that your hedgehog is having a difficult time curling its body into a ball, that only means that it has gained much weight and you will need to reduce the amount of food that you offer to your pet. Your pet will love to have some tasty treats from time to time. When you need to do that, you may opt to offer any of the following as treats: mealworms, apples, bananas, boiled eggs, boiled chicken, berries. You will need to chop the food that you would like to offer to your pet, however. As there are best food for hedgehogs, there are also those food items that will be harmful when given to a hedgehog. Do not feed your pet any of these foods: grapes and raisins (toxic to hedgehogs), nuts (can cause choking), and wild insects (can cause parasite infection). If you have been caring for a hedgehog for some time now, what foods do you offer your pet?